Don’t miss your chance at a FREE Pizza from Papa John’s! 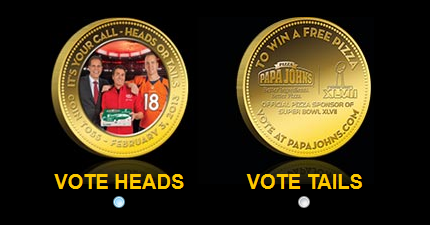 Vote heads or tails in their Super Bowl coin toss by 2/2 and if you guess correctly you get a FREE Large 1-Topping Pizza. This really couldn’t be simpler and 50-50 odds for free pizza is pretty sweet! You’ll also get a 50% off coupon code just for voting. Hint: I voted tails & had my husband vote heads, so I guess either way we’ll be enjoying a free pizza on February 4th when they email the codes out!